The first column is average number of lines added/deleted. The second column is colour → colour transition. The third column is sample size. 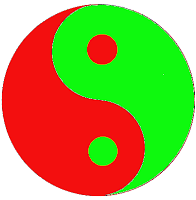 If you're at red or green and you make a small change (5.39,6.01,7.52) you're likely to stay at red or green. If you're at red or green and you make a large change (13.65,17.67) you're likely to transition to amber. There is a big spike in the number of amber → amber transitions (1462). I speculate that long sequences of these transitions are occuring after a large 13.65 green → amber or 17.67 red → amber transition. I think the green → green value of 22.18 is larger than it should be because it's including plain file renames.